In the seventeenth and eighteenth centuries, a newfound love of spontaneity transformed Christian worship and revolutionized the Enlightenment's "culture of sensibility. "Rituals of Spontaneitytells the story of how and why spontaneity came to be so revered. 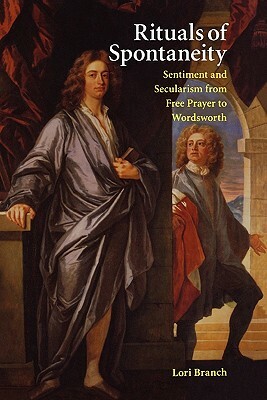 Using archival material and works of Bunyan, Shaftesbury, Goldsmith, Smart, and Wordsworth, Branch shows that the rise of spontaneity was intimately connected to the forces of commerce and science at the dawn of the Enlightenment. By focusing on the language in which spontaneity was defended and on its psychological repercussions, Rituals of Spontaneity challenges previous understanding of secularization and demonstrates the deep, often troubling connections between religion and secularism in modernity.